Iiiiit’s Chriiiiistmaaaaas (©Noddy Holder 1973). Which means Christmas telly. When we reviewed Christmas day telly the other year, we made this comment: This Christmas we’re treated to a stocking full of Christmas specials by the BBC. ITV on the other hand showed a load of Harry Potter films and Paul O’Grady doing something with dogs. This year it was much the same but replace Harry Potter with Daniel Craig’s James Bond. However, ITV did make a real effort on Christmas day evening with Torvill and Dean, but more of that in a moment. 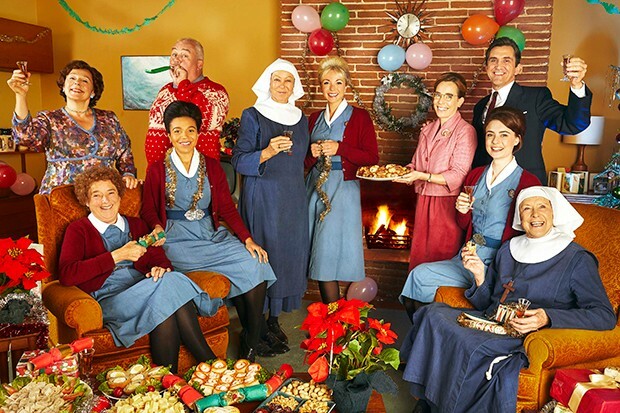 Let’s start with the most watched programme on Christmas Day, Call the Midwife. Two years ago, when we reviewed the Christmas special, we commented. The thing about Call the Midwife is that it’s very nice and full of terribly, terribly nice posh people. There are also very poor people, but it’s the job of the terribly, terribly nice posh people to look after them. As the saying goes, “if it ain’t broken, don’t fix it”. This year we were treated to more terribly nice midwives looking after terribly poor people in London’s East End; but a lot of the action took place outside of the borough of Poplar. I thought that the often referred to “Mother House” was like a Freda Fry in The Archers (i.e. always referred to but never actually heard), but this episode we got to see it in all its glory. Unfortunately, whenever they refer to the “Mother House” I always think of a “Mother Ship” and so expected a massive nunnery to descend from space, behind Devil’s mountain like the mother ship did in Close Encounters. Alas it was just a big old house by the sea. Here we met a whole raft of nuns (is that the collective noun for Nuns? Or is a it a wimple of nuns?). We were are also introduced to a new nun played by Miriam Margolyse who went from brand new character to Mother Superior in approx. 68 minutes 10 seconds (ok, exactly 68 minutes 10 seconds). By the end of the episode, Ginger Nun (the one who can’t drive) decided that like Richard Dreyfus in Close Encounters, she also wanted to stay in the mother ship…house. Whether this is just a way to introduce a new location for the new series (I think seven series on they have pretty much exhausted those two streets in Poplar now) or whether they just need to temporarily write out Ginger Nun because in reality she is off to have a baby (well they could hardly send her off to rehab like they did with Trixie when Helen George wanted to start a family could they? ), I don’t know. Elsewhere, Minty…I mean Frank, got into his usual scrapes culminating in a real donkey appearing at the nativity; Sister Monica Joan was seriously underused, which was a shame as she literally has all the best lines and they have now found how to deal with the doctor’s son who can’t act; just stick him behind a Super 8 cine camera so he can be in the scene but not have to act. All in all, business as usual. Due to a nice piece of scheduling once you finished with midwives, you could flick over to ITV and be transported from the 1960’s into the 1970’s with their drama about Torvill and Dean. I say drama, it was obviously intended as a two-hour trail for Dancing on Ice, as in every ad break, we were introduced to the new skaters. All in all, it was an enjoyable if at times slightly uncomfortable watch. Let’s start with the good. Will Tudor (Humans) and Poppy Lee Friar (Ackley Bridge) were engaging as Chris and Jane, although Stephen Tomkinson had the best line of any drama in a long time. When realising that he and his wife had to exit the scene so that the estranged couple could have a heart-to-heart he uttered to his wife “let’s go and check on the crisp situation”. This is now my go-to phrase when I need to exit any awkward situation. We also had Anita Dobson who is now to the go-to actor for “slightly barking old woman”. The bad; all over the nation people were left agog and dismayed that Christopher Dean was a right basta…. nasty piece of work. Torvill and Dean were involved in the making of the drama and I know that it was no secret that Christopher Dean was a hard task master, but really, was he that angry all the time? Talk about never meeting your heroes. I hope he has mellowed now. The main problem I had though was the dilemma that so many 20th century period dramas have, in that they don’t quite get the period right. If you pay big bucks you can have an accurate 1970’s setting like we saw in Life on Mars. But this was filmed in Northern Ireland (there was a definitely a grant involved, and that’s not me being snarky, it was clearly referred to at the end of the credits). Apparently, the producers used a Belfast ice rink, as the Nottingham Ice rink “looked too 2018”. Presumably that means that the Nottingham Ice rink now has iPhone charging points and a branch of Starbucks where the tea bar used to be. A few years ago, there was a drama about the story behind Dad’s Army which was a great story and had a stand out performance from John Sessions as Arthur Lowe. However, this was also made in Northern Ireland and it was let down by the scenes set in TV Centre. Anyone who watched Blue Peter up to its move to Salford knows what TV Centre looked like; anyone who watched Children in Need until its move to Elstree knows what TV Centre looks like; anyone who watched The Apprentice a few weeks ago knows what TV Centre looks like… because they were there! It’s round and concrete like. In the Dad’s Army drama, it was obviously just a 1960’s Belfast office block with a sign saying “TV Centre” stuck on it. This one ice rink doubled (or trebled) as Nottingham Ice Rink, then with a bit of CGI the Olympic Ice Rink in Sarajevo and also every ice rink Torvill ever competed on across Europe. Ok, perhaps I’m being a bit pedantic saying “great story; great performances shame about the set” but was just a bit glaring to me. You agree? No? Ok. Sorry. I’ll just go and check on the crisp situation. To receive updates from Shouting at the Telly, either subscribe using the buttons above, like our Facebook page or follow us on Twitter.